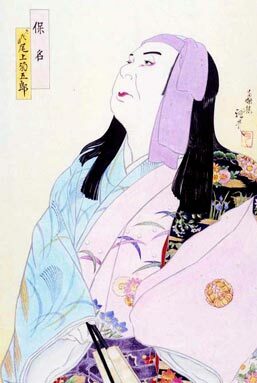 The 7-role hengemono "Miyama no Hana Todokanu Edaburi" was staged for the first time in the 3rd lunar month of 1818 at the Miyakoza, starring Onoe Kikugorô III in the seven roles. One of these roles was called "Kosode Monogurui" ("the short-sleeved garment madness"). It became an independent Kiyomoto-based dance called "Yasuna". The great star Onoe Kikugorô VI created his own version in 1922, which became extremely popular. "Yasuna" is frequently performed nowadays. Abe no Yasuna was a young man who get engaged to the famous astronomer Kamo no Yasunori's daughter Sakaki-no-Mae. Unfortunately for Yasuna, The Kamo family had a lot of misfortune: the astronomer died, then Sakaki-no-Mae was driven to commit suicide by her cruel step-mother. This event drove Yasuna mad with grief and, wearing Sakaki-no-Mae's beautiful short-sleeved silk garment and a yamai hachimaki, a purple headband (a symbol for insanity), he wanders aimlessly in the countryside. It is spring and all the cherry trees are in full blossom. Yasuna's mind mixes his past happiness and his present sorrow. 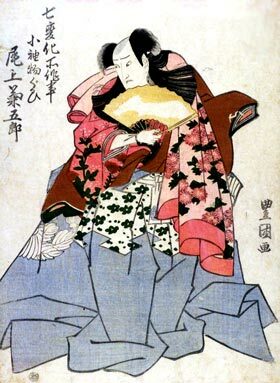 He dreams that the garment is Sakaki-no-Mae but he realizes at the end that it is an illusion. His love is lost forever. The great Onoe Kikugorô VI said he felt like walking on top of clouds in a dream while performing this role.